The number of photographs may have been few but the quality was present. 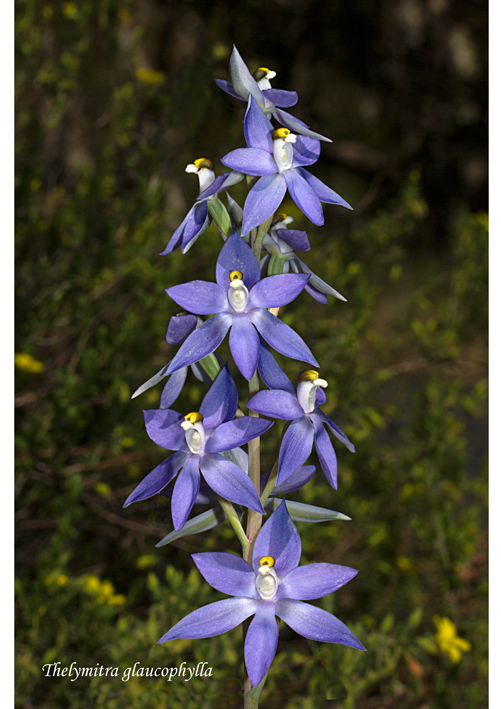 The clear winner was Claire Chesson’s Thelymitra glaucophylla (Glaucous Leaf Sun Orchid). Flowering from October to December, this endemic grassy woodland species of the ranges was only published in 2013 by Jeff Jeanes in the Mulleria 31:3 – 30 (2013) but it had been recognized much earlier by Bob Bates and has appeared with this name in his electronic Orchids of South Australia since 2005. It belongs to the T. nuda complex, of which there are 15 species, six of them having only been published in 2013. This complex is characterised by having large scented blue multiple flowers that open freely. Not seen in this picture is the leaf and though the leaf is highly variable – 10-50cm long, 8-20mm wide, erect and short, long and flaccid, Jeanes mentions that T. glaucophylla “can be identified with a high degree of confidence from the mature leaves alone” (Page 4 Vol 31, 2013 Mulleria). The main features of the leaf are grey-green glaucous ie white bloom and is often senescent (withered) at anthesis (full flowered). Of the T. nuda complex, T. megcalyptra is the most similar but its leaf is never glaucous and has a red base, as well as an earlier flowering time and habitat of plains and rock outcrops. This entry was posted in Conservation, Monthly photo competition and tagged Australian orchids, Glaucous Leaf Sun Orchid, Native Orchids, Orchid Identification, orchids, photography, South Australian Orchids, Sun Orchid, terrestrial, Terrestrial orchids, Thelymitra, Thelymitra glaucophylla, Thelymitra megcalyptra, Thelymitra nuda, Wild Orchid. Bookmark the permalink.